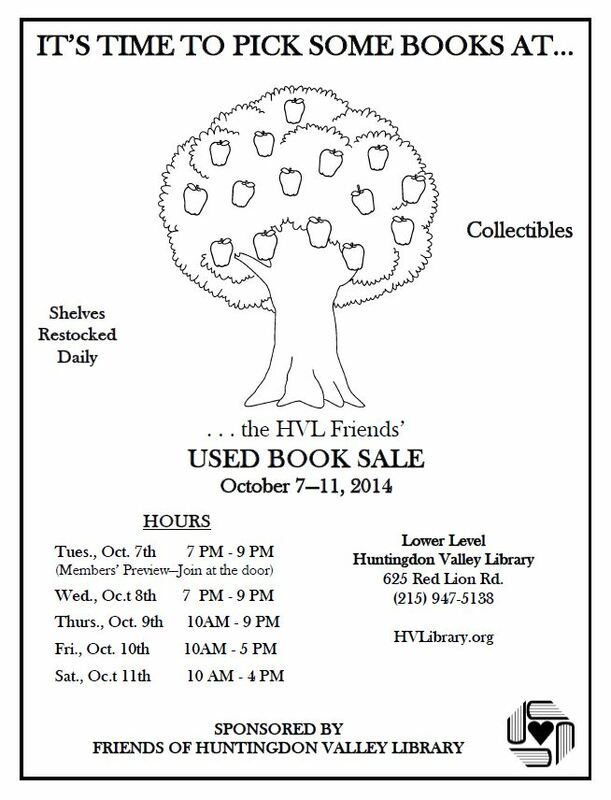 Information about the Huntindgon Valley Friends of the Library. Preschool Storytime – Mon., Oct. 19 at 10:30 to 11:30 am. Preschool storytime with Miss Glynnis. Children ages 3-5. Join us for books, songs, finger plays, and a craft. Sit N Knit – Mon., Oct. 19 at 4 pm for knitters of all levels and ages! Toddler Storytime – Tues., Oct. 20 at 10:30 am. Toddler storytime with Miss Jessica for children ages 1 and 2 years. Come join us for: interactive stories, songs with finger plays and nursery rhymes on felt board. Medicare for 2016 -Tue., Oct. 20 at 7 pm. Medicare 2016 will focus on the options available to Medicare beneficiaries who have choices to make during the annual Open Enrollment period (October 15 to December7). Please RSVP. Presented by APPRISE. 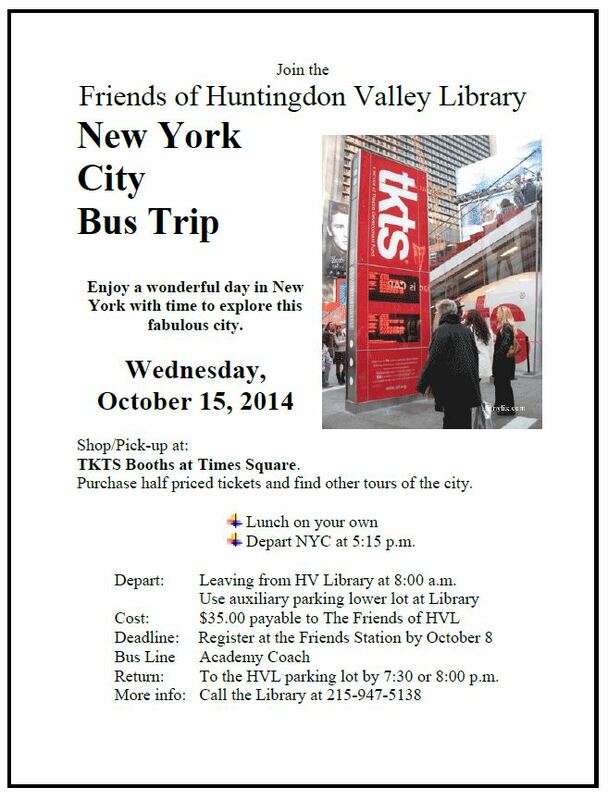 Friends NYC Bus Trip -Wed., Oct. 21 at 8 am. Double check which bus you’re on – one picks up at the Library and the other at the K-Mart on Street Road. Library Yoga – Wed., Oct. 21 at 10:30 am in Community Room with Theresa Landolfi. $7 per session, drop in. Tea at 6:30 pm – join us in thanking the Friends for all they do! Friday Movie Matinee – Fri., Oct. 23 at 2 pm. Movies are free and open to the public. Deadline! -Sat., Oct. 24 at 5 pm (when the Library closes). Winners will be notified on Friday, November 20, 2015. Award Ceremony and Reception for Winners: Thursday, December 3,2015 at 7:00 pm upstairs in the Community Room. May is just around the corner and we have another full month of programs for all ages! PROGRAM POSTPONED – we will work with the presenter to find a new date and time for this program. Silent Auction – Look, Bid and Win! Every month, the Friends look through their donations and pull a handful of books to sell at their Silent Auction. 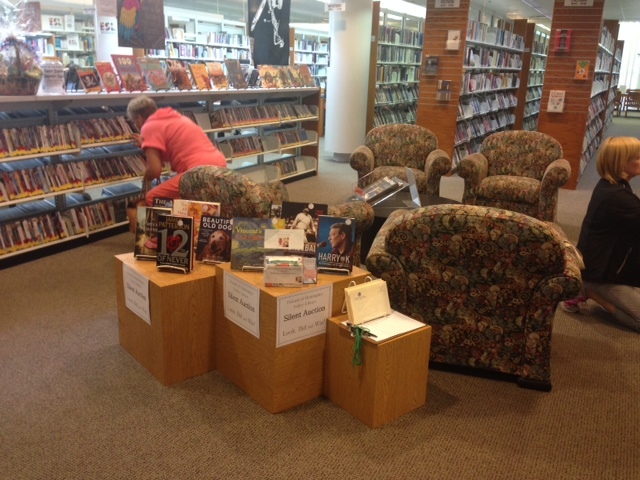 After a few false-starts, we took Debbie’s suggestion and created a new display space for the Silent Auction near the New Books section. This ongoing fundraiser nets approximately $600 a year, which helps fund the Wish List – an annual list of projects, programs, and collection needs determined by the Library and funded by the Friends. So far in 2014, this support has allowed us to create a new English as a Second Language collection, infuse best-selling paperback books, add new eBooks to OverDrive, add audiobooks and music CDs, support our Large Print collection, and most important – made Summer Reading possible! In 2013, the Friends provided the Library $35,571 in support! We enhanced the Children’s Department, added to the Genre Fiction sections (Fantasy, Mystery and Science Fiction), added Playaway Audiobooks and started a new collection of Playaway View digital video players for the Children’s Department…to name just a few. New York City Bus Trip – Wed., Oct. 15. Drop off at TKTS Booths at Times Square. Only $35 for a wonderful fall day in New York City! Basket of Books and Prizes raffle. New this year will be a basket just for Kids! To Join the Friends, stop by and pick up a Newsletter and membership envelop. Dues are just $10 per calendar year. Friends members are able to check out museum passes, attend the monthly membership meetings, and support the Huntingdon Valley Library through volunteer opportunities, fundraisers, and as advocates of the Library in the community. Learn more about the Friends and read the 2014 Newsletter. Put it in the jar provided. Look through the books and find the number of the one(s) you want to bid on. Record your bid on the clip-board. Check back throughout the month to see if you need to increase your bid. If you win, you will be called by the Friends. Take it home to enjoy! Tue, Oct. 7 from 7-9 pm – Member’s Preview. Pay at the Door. Children K to 5th grade can reserve a 20-minute slot to read to a therapy dog in a small group. Please sign up at the circ desk or by phone at 215-947-5138. Stories, songs and crafts for 3, 4 & 5 year-olds. Stories and music for 1 and 2 year olds. Miss Glynnis will share stories, songs and a craft. All ages welcome and you can wear your pajamas for storytime – registration is not required. Pat will read from her children’s book Emily Goes to Philadelphia. Pretzels and refreshments served. All ages welcome. Registration is requested. Ahoy, matey! 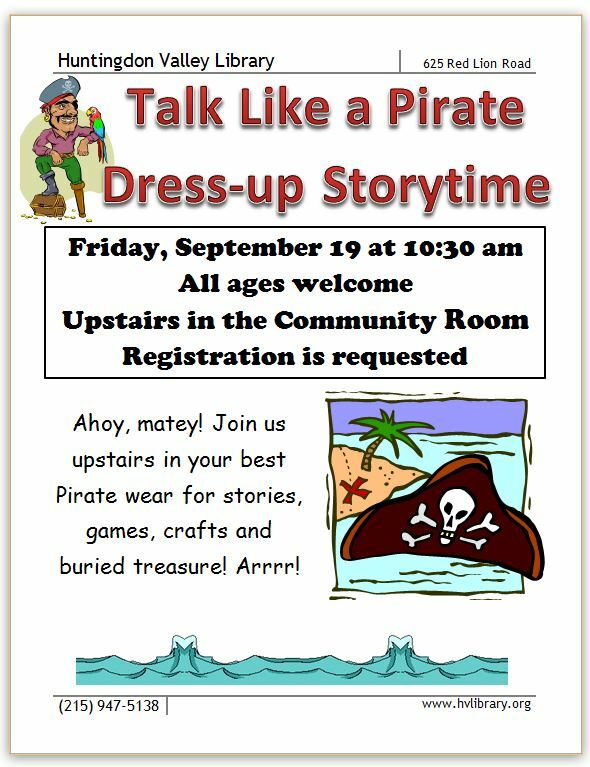 Join us upstairs in your best pirate wear for stories, games, crafts and buried treasure! Arrr! Registration be requested, matey. Join us in this lively 45-minute monthly class for you and your little loves! All ages welcome. Registration is required. Sponsored by Friends of Huntingdon Valley Library. Notice: The Friends’ and Library Fall Foreign Film Series scheduled for tonight and Sept. 18 has been canceled, but will be rescheduled. Due to unforeseen circumstances, our presenter is unable to attend. We apologize for this inconvenience and thank you for your understanding. Discuss the Academy Award Winning Films Amour and La Grande Bellezza with Maurizio Giammarco during the 2014 Fall Foreign Film Series, sponsored by the Library and Friends of Huntingdon Valley Library. Please RSVP to help Maurizio prepare discussion materials.